Transcribing techniques to help you improvise, orchestrate, compose. How to maximize your creativity and productivity. How to develop your craft by consolidating techniques. How to read music with your ears. How you can write music without using an instrument. How to write music spontaneously, as your ear guides your hand. How to communicate accurately through music notation. Why you don't need "perfect pitch." Tools to develop your music perception. 140 exercises, many music examples-models for a lifetime of study. Resources for composing, orchestrating, film scoring. Where to find supplies, organizations, information, inspiration. Working in the music business. Reference section includes books, supplies, websites. A standard reference for every serious musician or music educator. A wealth of practical information. A book that has needed to be written.--Dr. Thom Mason, Professor of Jazz Studies, U.S.C. Ron Gorow has been in the music business in Hollywood for over 40 years, working in film, TV, records, live acts and publishing. He is a member of Professional Musicians Local 47, Recording Musicians Association, International Association of Jazz Educators and ASCAP. 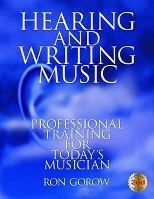 He has consolidated his experience as a composer, orchestrator, arranger, copyist, music engraver, score proofreader, musicologist and teacher to develop the techniques presented in Hearing and Writing Music. NEW EXPANDED SECOND EDITION ! Our price: $23.95 + $10 shipping for first item, others $6 each.